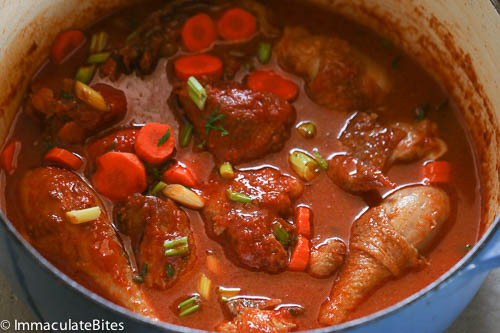 African Chicken Stew — African Chicken Stew- A stew like no other. Easy, Aromatic and Flavorful . Great weeknight meal. Paired with Savory Coconut Rice! 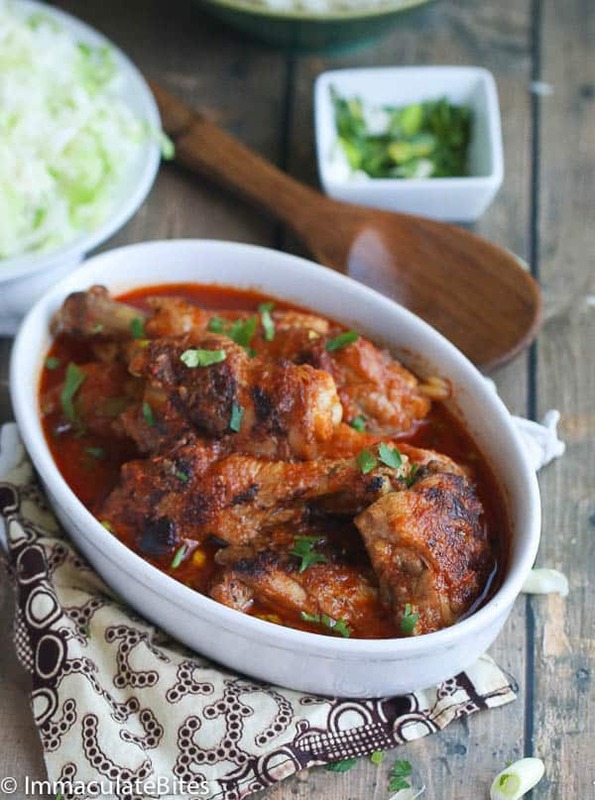 African Chicken Stew- A stew like no other. Easy, Aromatic and Flavorful . Great weeknight meal. Paired with Savory Coconut Rice! Can I use potatoes in this while it cooks? Would this work adding berbere spice? I want a doro wat type of stew. It would work just fine. Alaafia! I want to say thank you for sharing. I enjoyed this. I used chicken breast, I added just a 1/4 teaspoon of cornstarch in the end and spiked with a pinch of cayenne pepper. This is easy and tasty. Hello! I’m doing a tour around the world in my kitchen (in alphabetical order) with my mom who also loves to cook. We’ve been having a blast and this dish looks incredible, I can’t wait to try it! One quick question, do you use a more standard paprika or smoked paprika? You list just “paprika” twice but then said to put in the “smoked paprika” along with the other spices. There would certainly be a difference using one or the other. Thank you! Any of the two would actually work fine. Enjoy! Green onions as in scallions? Yes. Green onions or scallions. I made this recipe and it was delicious. Browned chicken in frying pan, used fresh tomatoes and followed the recipe. Put the brown chicken and ingredients in my instantpot. Wonderful. Awesome! Thanks for taking the time to share your thoughts with us. Hi do you only add water when it says so? Hi Stephanie. Updated the recipe box. Add about 2 cups of water and adjust the thickness of the soup using water or stock. This was fantastic and warming on a cold winter night in Australia! thank you! Could I use sweet potato instead of carrots? 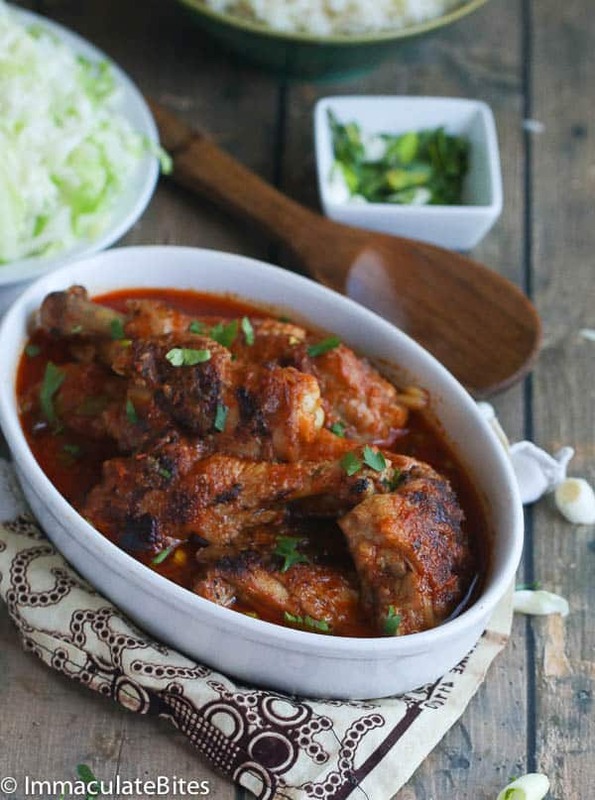 Wao a very nice recipe…I made it after going through the recipe right here….It wa amazingly delicious. Am from India and was looking for an African cuisine and got here. Glad you like it, Saurav! Thanks for stopping by! I made this last night and it was delicious! My sons father is from Liberia and he makes this when he comes but I didn’t have the recipe. This is close! I added a box of frozen spinach to it like he does (squeezing out the excess water) and added a tad of cayenne pepper. I’d post a picture if I could. Thank you so much! Awesome ! So glad to hear it worked out well for you. Love the spinach addition. Thanks for taking the time to let me know. Just tried this for my family and it was a big success. 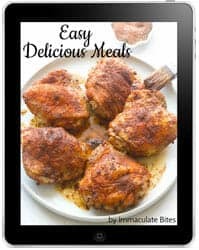 Cannot wait to try some more of your recipes. Great! Glad to hear it worked out well for you. Thanks for the feedback! I was grateful for this because it teaches me more on how to cook a better foods. I added some potatoes and celery it was great thank you! You are Welcome! Glad to hear it worked out well for you. Yes I do . Here are a few Yassa chicken here . 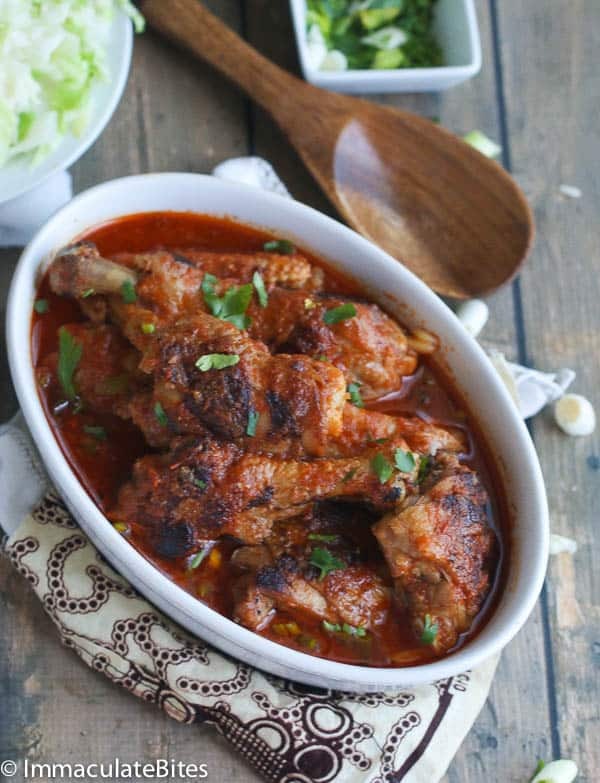 https://www.africanbites.com/yassa-chickenpoulet-au-yassa/ , Thieboudienne here ,https://www.africanbites.com/thieboudienne-ceebu-jen-poisson-au-riz/, peanut soup here https://www.africanbites.com/maafe-west-african-peanut-soup/. Enjoy. Thanks for stopping by!!! I recently married a man from Nigeria. Trying to learn more African dishes so I made this tonight. He loved it…thanks for sharing! I’ll have to check out more from you. Awesome! Glad he did. I have plenty more on here to try out. Do let me know which ones you try out. Thanks for taking the time to share your thoughts with us. I am going to try this,it’s sounds yummy.thanks for sharing,yes Kenyan love chicken. Oh Yes! I do too! Thanks for taking the time to share your thoughts. Thank you so much! Glad you love it. Hi, I recently married a man from Burkina Faso. I’m trying this recipe tonight for for the first time. I didn’t have tomato sauce but I use Roma tomatoes with tomatoes paste. It smells amazing! I can’t wait to let you know what he thinks! Thank you! This looks very delicious. Thank you so much for the chicken stew African style. 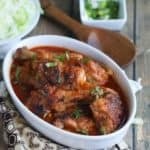 I have been looking for a chicken stew recipe using a rotisserie chicken. Any advise how I would be able to use your recipe into it. God Bless! Make it the same way( might have to shorten the cooking time). Throw in the chicken towards the last 15minutes of cooking. In the post you refer to Kenya as a West African country. I’m fairly sure you know it’s not and it was a mistake, but much of the world probably doesn’t know this. So I just wanted to point that out. Hi Tricia! Definitely a mistake. Thanks for pointing out to me- will update post. Hi! This looks great. Which oil would you recommend using for this recipe? Canola? After browning the chicken. 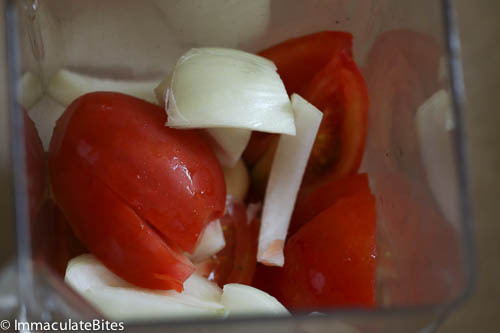 Add onions and tomato blend. Saute for about 5 minutes and finish it off in the crock pot. About 3-4 hours on high. Thank you! I tried it in the crockpot and it was delicious! Hi Imma! I have been following your website for some time now. I’m South African and my boyfriend is Cameroonian. 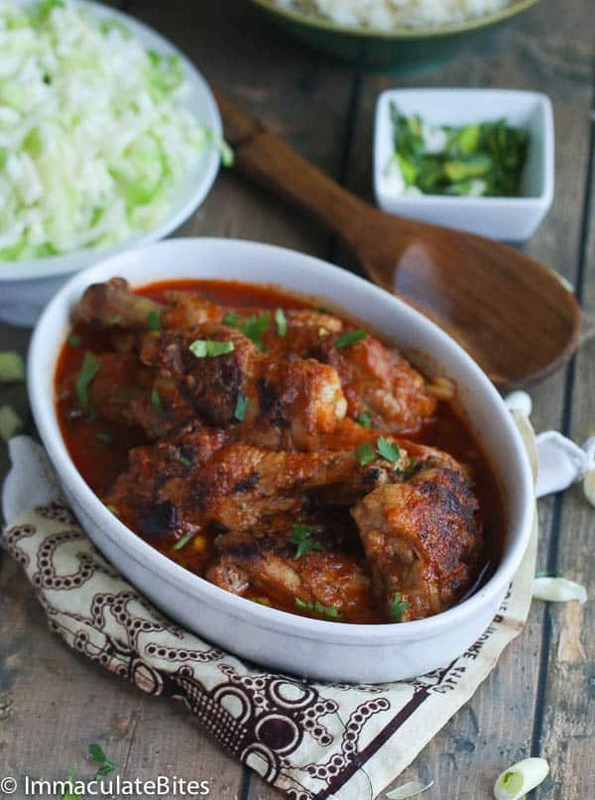 I made this dish for him today – first thing he asked was “how did you make this….. this is a Cameroonian dish”. 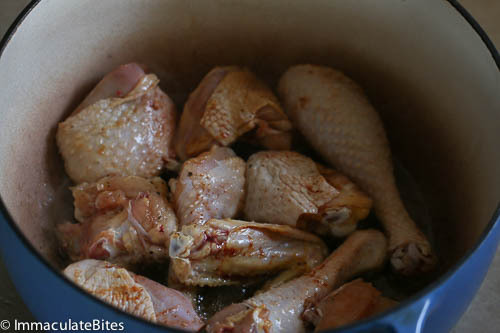 I fried tha chicken in a pot with some cajun spices. I then blended tomatoes, onions, garlic and chilli. I dissolved the maggie cube in hot water and added to the tomatoe mixture. I cooked that and added 2 tbsps of tomato paste and cooked for about 25 minutes. I served it with rice and it was a winner! I’m a chef by profession but my favourite guests to serve are my family and friends. 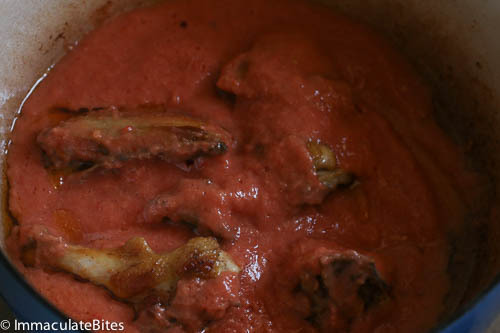 I have tasted Ndolé ad Eru soup from his friends and can’t wait to make those too! This a great recipe thanks for sharing it. Everyone went back for second even my pickie eater. Awesome! Thanks for taking the time to share this with me. I was just wondering if you could tell if the Maggi or bouillon granules, chicken or vegetable? Can’t wait to make this. I usually just go with what I have in my pantry. 9 out 10 times it’s chicken bouillon powder . Is it possible to use gencent,especially if i want to make sandwich chicken stew and serve it in bread. It is matter of personal taste. I really don’t like it in my stews unless it’s Njangsa stew. I would say start with very little. I took a Swahili class back in the 80s. When the course was over we had a party and made something very similar to this with fried spinach and coconut rice. The main difference is the pieces of chicken were cut through the bone into very small pieces (so that everyone in the village could get a piece). It was annoying to find so many tiny bone pieces in the stew, but the flavor was amazing! I’ve tried it both ways, one way is easier to eat, the other is even more delicious. Totally agree with you Bruce! Just the way we make it too. Sharing with my friends. The seasoning in this recipe sounds so delicious! We have a dish called African chicken in China but it’s nothing like this. Very interesting to know you can use curry powder with the thyme and parsley. Yum! Hearty stews like this are definitely on the agenda right now – the winter weather here demands it! I must make this recipe. Looks SO flavoursome and I can imagine smells divine. It is prepared throughout West Africa and some East African Countries with each having their own variation. Really good. What country’s cuisine does this dish come from? Hello, I used to live in Nigeria and am going to make this for my friends next week 🙂 what kind of oil do you use? Is Palm oil a good idea? Also, since I’m making fish pepper soup as a starter, I’ll have some crayfish leftover.. Do you suggest adding some? Sarah, I used canola oil- I would not recommend palm oil. Honestly, I have never made stew with crayfish. I would say hold off on the crayfish, this stew is really flavorful. Please let me know how it works for you. Thanks. Hello. Is it possible for you to post pictures of the process like you did with the jallof rice. I know it may be asking much, but it was helpful to see what each step should look like with the rice. Thanks. I was thinking of making kale.with it as well. I will be making this for.me and 4 of my sons tomorrow. Kale would be a great addition. Happy Cooking !!! This looks great! How much smoked paprika would you recommend? You don’t specify in the recipe. I adore stew.. have u tried using both canned tomatoes and puree ? It’s give another lovely taste . Takes for time but lovely. I blend my tomatoes with ginger,garlic ,onions then pot it in a small pot but on fire and let it boil until it’s completely chickens , no water remaing inside. Then in another pot fry onions then add tomatoes puree let it cook for say 5min while stirring occasionally , then add ur boiled blended tomatoes , stir add chicken stock , fried chicken and every other seasoning as well as a cup of water. Leave to cook until water dries off. Just sharing a other method. Lucrese that is a must try for me , will definitely give it a try. Thanks for sharing! My roommates are from Congo their mom cooked this for us when she came to stay I’m thinking of making it bc was really good. How do you think it would be if I broiled the chicken for part time then mix it with the sauce? Awesome! Thanks for the feed back!